ColtUK - The Mitsubishi Colt Owners Club • View topic - Colt Cleartec recomended oil? Post subject: Colt Cleartec recomended oil? I have a 2009 1.3 cleartec. due a service but what is the recommended oil? I have searched on hear and nothing came up for the cleartec model. On Mitsubishi's web site they say it has lower viscosity oil but checking various oil websites like Opie oils they just recommend a standard oil viscosity - something like 10w40. Post subject: Re: Colt Cleartec recomended oil? Anyone know if there is any difference between the cleartec engine and a standard colt 1.3 engine so it can run on 0w20 oil? Does anyone know the quantity of oil required for change? According to both Castrol and Liqui Moly there should be exactly 4 liters in it. 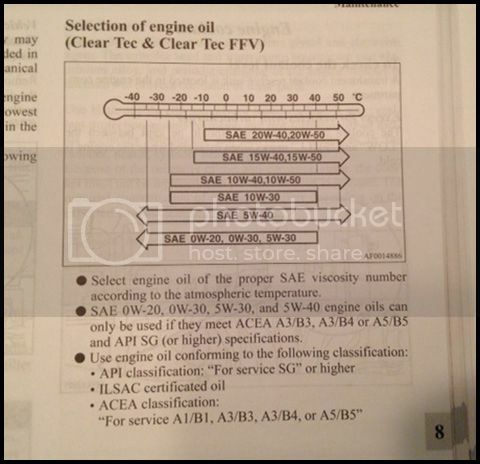 I was looking through my manual last night (typically dont have it with me tonight... )and the recommended oil of 0w/20 is way too thin IMO. As the OP said a common oil like 0w/40. There are several oils that can be used. I will return to this thread tomorrow if i remember and quote the oils that can be used direct from the owners manual. I find this a bit much, i would better use 10/15 till -10°C and 5/10 below.